Roulette is an iconic casino game that is fun to watch, fun to play, and even more fun to win at. Sadly, this game, made famous by so many movies and television shows, is historically one of the big money makers for the casinos and not the players, since the odds fall dramatically in favor of the house. Until now. The best strategies for American roulette and European roulette are identical, but first read the basic roulette rules if you are new to the game. 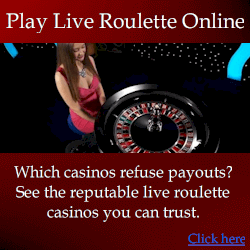 Roulette is a game played on a spinning wheel that has red and black slots. The slots are numbered one through 37 in European roulette and one to 38 in American roulette. To tip the odds in the house’s favor, two green slots numbered 0 and 00 are also on the wheel. A casino employee spins the wheel and drops a small marble sized ball onto the spinning disk. The idea is to guess which number or color the ball will land on when the spinning stops. Bets are placed on a table with a number of different betting options, each with its own odds. Bets can be placed on colors (red or black), numbers (odds or evens), the green zeros, a “straight” single number bet, a split bet where the player bets that the ball will land on either of two adjoining numbers, “street” bets where the ball would land in a section of numbers that account for one-third of the numbers, a corner bet (an intersection of four numbers) and a whole variety of specialty bets. Don’t worry, money is not made by knowing all the variations of bets, but in understanding the basics of the game and exploiting its weaknesses through strategy. There have been thousands of individuals who have tried to beat the roulette wheel ever since it was introduced in France in the 18th century. Many people believe, falsely, that past results on a wheel will influence the future spins. They have developed many systems based off of this incorrect math. In reality, the odds of a number or color being spun is the same each time. There is a just less than a 50 percent chance the ball will land on red regardless of how many times it has happened in the past (just less than 50 because there are 2 green slots as well). Each spin is entirely independent of the past spins and not, as some would have you believe, connected by some cosmic force. There is, however, a way to beat the game. The best roulette strategy ever is not based on hinkey math, but on the individual characteristics of a man-made wheel. Each wheel has its own tendencies, though small, which can be tracked and acted upon with proper training or electronic support (roulette computers). This phenomenon, known as “wheel bias” is real and can be used to make a ton of money if you understand the proper strategies. 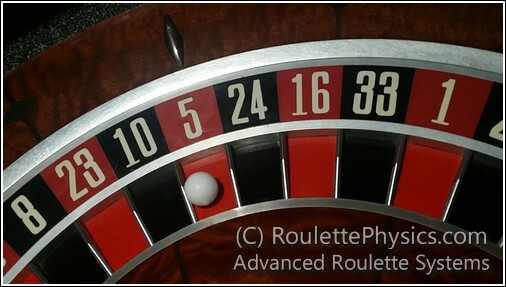 While the roulette wheel is designed to be entirely random, it is not, and you do not need fancy mathematics and formulas to use this information. Most players putting money down are trusting luck, useless tricks, or a betting strategy that makes the game truly gambling instead of a game of skill. With the best roulette strategy ever, when the croupier drops the ball on the spinning wheel, you can expect to win most of the time. The difference between this strategy and useless systems is that it is based on the physics of roulette and placing inside bets based on the wheel bias. Do note that this strategy only works on real wheels and not online virtual ones. Although it will work with online casinos that feature a camera focused on a real roulette wheel that is being spun in an actual casino. There are systems that simply don’t work. The most famous of them are the Labouchère system and the Martingale system based on the idea that if you keep increasing your bet to cover your previous losses you will eventually win and come out ahead. This would work almost every time if you had a large enough bankroll and an unlimited betting cap. However, to combat gamblers making huge hauls and increasing their chances of defeating this system, casinos simply put bet limits at their tables. If a table has a $2,000 limit, once your losses were at or over $1,000, doubling your bet would only allow you to break even; and, if you lose then your losses start to compound. With only a $5 initial bet, you could be in this hole with a string of only 8 losses and many wheels routinely come up with strings much longer than these. If you are counting on a betting progression strategy, you need to plan on losing. Increasing the size of the bets does little more than increase your risk. 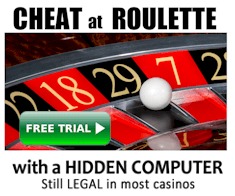 Using the physics of roulette and the best roulette strategy ever, however, you will be able to determine which wheels are able to be beaten (not all can be), which bets to make to maximize your odds and payout, and how to avoid detection. A word of caution, this isn’t magic. The strategy is very easy to learn, but implementing it still takes time and effort. You have to go to the casino and you have to play. On average, you need to spend at least 20 hours each week at the wheel. Compare this to the 40 hours plus each week you put in at work for peanuts and you see the advantage, yet some people get too bored to continue even with tens of thousands of dollars to be made each month. That said, if you enjoy gambling and are willing to put in a little time and effort, you can not only win at roulette, you can win big.